The 2009 NHRA Las Vegas Nationals was run over the much celebrated Halloween weekend and it must have been a little spooky to the American racers and fans to see a healthy contingent of European competitors suddenly in attendance, not least, two pairs of Top Fuellers from four individual countries and when Norway's Thomas Nataas put down a 3.859/307 one-thousand footer for number five qualifier in the second session it got scary for a number of home teams. Thomas, driving the machine owned and tuned by Per Andersen and Karsten Andersen was bumped down into a non shabby eighth place in the twenty-five car field at the end of the day. Swiss man Urs Erbacher managed thirteenth place with Denmark's Stig Neergaard in fourteenth with 3.927/295 and 3.963/299 respectively. Unfortunately, Holland's Lex Joon failed to make it a fourth European in the field with a DNQ of a troubled 5.819/110. 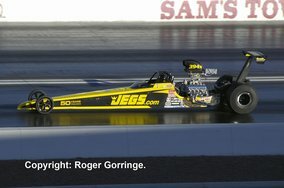 Sitting on pole position was Larry Dixon with a 3.805/318. 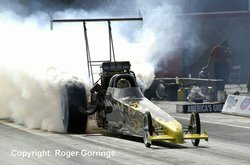 Round one saw all three Europeans go out, disappointed but not dismayed, Nataas uncharacteristically went immediately into tyre smoke against Doug Kalitta, Neergaard was losing cylinders early slowing him to a losing 6.954/86 as Antron Brown fire-balled his way to win with a 4.012/247 and finally Erbacher failed to keep up with Tony Schumacher as The Sarge zoomed away to record a 3.844/319 to the losing 4.028/289. Keeping the visitors company back in the trailers were Shawn Langdon, Bob Vandergriff, Dave Grubnic, Morgan Lucas and Terry McMillen. Surprises occurred in round two as big names went out, Brandon Bernstein ran a winning 3.882/311 to defeat Antron Brown's close 3.894/311, whilst Cory McClenathan holeshot Tony Schumacher, 3.860/36 to a losing 3.868/318. 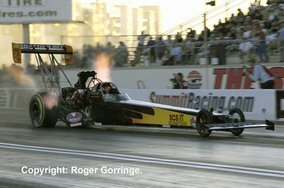 Steve Torrence went into tyre smoke at 100 feet out leaving Spencer Massey a 3.878/314 win. Larry Dixon piled the point pressure on Schumacher by winning the bout with Doug Kalitta, 3.849/315 to the 3.909/313 lose to end the round. Spencer Massey showed form with a better leave and a 3.849/315 win to oust Brandon Bernstein's 3.898/311 try and Larry Dixon beat Cory McClenathan by almost a car length with a 3.845/314 as Cory Mac was a little late on the leave recording a 3.844/316 lose. The final saw a big upset as Spencer Massey in the U.S. Smokeless Tobacco Co/United Association machine owned by Don Prudhomme left first and stayed well ahead to secure the light as Larry Dixon in the Al-Anabi Racing dragster slowed after hitting tyre smoke, it was the lights in Massey's lane that showed the win, a 3.827/314 as Dixon slowed to a 5.503/174. 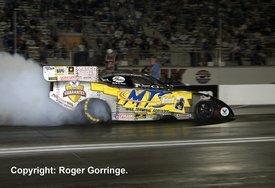 No great international field in the nineteen-car Funny Car class which was led by Matt Hagen on a 4.030/313 one-thousand foot timing although Grant Downing with New Zealand ties sat on the bubble. 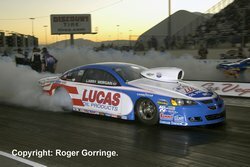 During round one names such as Jim Head, Bob Tasca lll, Grant Downing, Gary Densham, Ashley Force Hood, Jeff Arend, Cruz Pedregon and Mike Neff all suffered defeat. Top qualifier Matt Hagen in the second round went all over his lane as opponent Jack Beckman stayed clear of the centre line and took the win with a 4.210/285 to the close 4.242/287. Tim Wilkerson just got the better of Ron Capps in a close bout, 4.163/301 win to the 4.157/303 lose as in the next pairing teammates John Force and Robert Hight faced off with Force going up in smoke just past the tree, his 5.723/142 lost to the 4.125/309. Tony Pedregon then failed to reel in the lead that Del Worsham had with Del getting the nod, 4.232/269 win to the chasing 4.176/303. 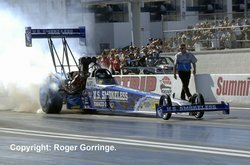 The semi-finals pitted Jack Beckman against Del Worsham but Worsham went into immediate smoke as Beckman ran the winning 4.359/262 numbers. 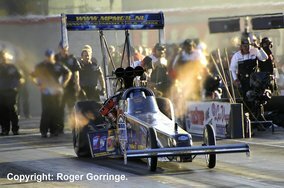 Robert Hight carried on the Team Force juggernaut with a win and pass to the final, a 4.080/312 beat Tim Wilkerson's 4.233/285. 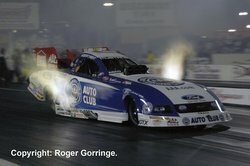 It was the Automobile Club of Southern California Mustang of Robert Hight that followed Jack Beckman's Valvoline/Mail Terminal Services out of the hole and in a classic drag race chased Beckman down and taking the win with a 4.125/304 win to the 4.154/303 lose. 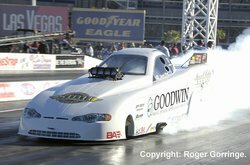 There were twenty-one runners in Pro Stock with 0.119 seconds separating the top sixteen led by Mike Edwards with a 6.623/207. Firt round victims were Jason Line, Warren Johnson, Allen Johnson, Johnny Gray, Ronnie Humphrey, Vinnie Deceglie, Kurt Johnson and Ryan Ondrejko showing it was no easy trip down the quarter mile. Again in round two big names went out including Greg Anderson, top qualifier Mike Edwards, Jeg Coughlin and Roger Brogdon leaving round three in the hands of Larry Morgan who beat Greg Stanfield off the line and holding on to take the win in 6.729/205 as Stanfield chased in vain ending up with a 6.801/195 lose. 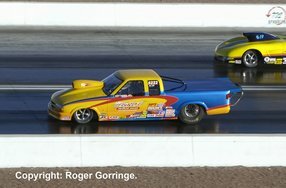 Ron Krisher pulled a blatent red light negating his 6.951/201 as Rickie Jones powered in pursuit ending up with the automatic win in 6.716/205. It has been a long time since Larry Morgan has notched up a final round win, seven years to be exact, Sonoma 2002 but this was his race as he carded a great 0.012 light in the Lucas Oil Dodge Stratus and held on the obtain the Wally with a 6.720/205 as runner-up Rickie Jones came in with a 6.794/203 for his first final round showing in the Quarter-Max/RJ Race Cars Stratus. Hector Arana led the twenty-two bike Pro Stock Motorcycle class with a stout 6.979/192 just ahead of Andrew Hines' 6.990/192. There were no more six-second runs until the semi finals and finals as the weekend warmed up. Once again there were surprises in who fell in round one with the list attracting big names such as Craig Treble, Michael Phillips, Junior Pippin, Steve Johnson, Jim Underdahl, Larry Cook, Mike Berry and Fred Camarena. Andrew Hines seemingly was in a dominant position as in round two he lit a 0.005 light and chased a quicker-leaving Douglas Horne down, 7.001/191 win to a 7.122/187 lose. 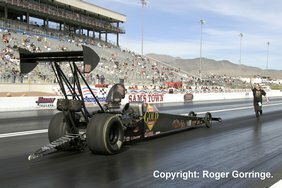 Matt Smith managed a near perfect light, 0.001 as he stormed off to record a 7.037/189 to defeat the 7.110/186 of Shawn Gann. David Hope was Hector Arana's next victim as a 7.113/186 was beaten by the 7.021/190 and finally Karen Stoffer fell to the 7.046/190 from Eddie Krawiec, Stoffer's close 7.090/190 not quite making it. The semis brought back the six second passes in the second pair but not before Eddie Krawiec failed to catch the lead set by Hector Arana, 7.039/190 win to the better but losing 7.028/190. Andrew Hines then took out Matt Smith with a 6.992/191 as Smith's 7.044/189 was not enough. 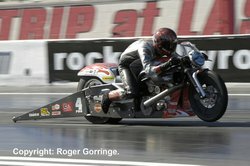 The final produced a double red light as Hector Arana's Lucas Oil Products '07 Buell left on a -0.144 with Andrew Hines on the Screamin' Eagle/Vance & Hines '09 HD V-Rod in hot pursuit on a -0.014 light. It was the first or worst and as Hines' light was least the award went to his 6.998/190 as Arana had seen his own demise and slowed to a 9.816/86. 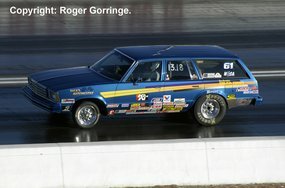 There was a race within a race in the popular Pro Modified class which has, not before time, been recognised by the NHRA by bringing it in as a Pro class of its own for 2010. The Pro Mod Matco Clash saw Mike Castellana's '70 Camaro take that trophy with a 6.261/230 against Burton Auxier driving a '68 Firebird who slowed to a 9.741/91. In the full race there were twenty one cars vying for a place in the sixteen-car eliminator with Brad Personett's turbo powered '68 Camaro sitting on top of the pile. 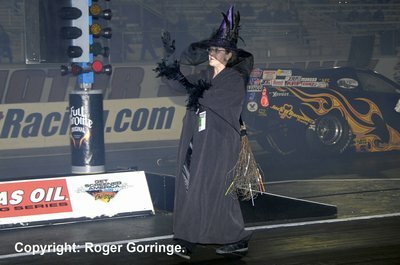 Round one saw losers such as Kenny Lang, Kirk Kuhns, Melanie Troxel, Danny Rowe, Rickie Smith, Mike Castellana, Kirk Wilmes and Tim Tindle go out. 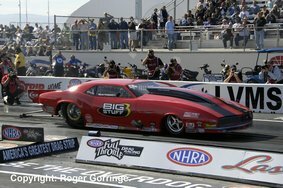 Round two had Joe Baker's 6.038/238 beat troubled Canadian, Raymond Commisso's slowed up 10.230/120. Dennis Radford's neat '70 Duster ran an easy 16.807/65 as the Get Screened America Pro Mod Challenge 2009 Champion, Burton Auxier fouled away his chance to go another round. 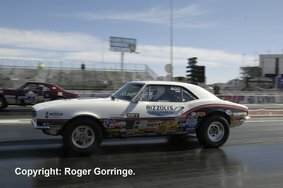 That turbo '68 Camaro of Brad Personett rapped out another 250 mph pass with a 5.922/250 win over Roger Burgess' red light time. 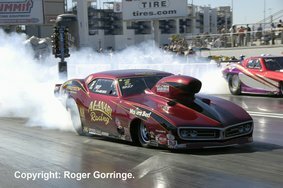 Last in the round was the win to Jay Payne over Chip King's '69 Daytona, 6.081/238 to a close 6.049/236. 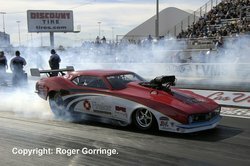 Jay Payne's FireIce backed '68 Camaro managed another 6.045/238 win this time over Dennis Radford's 6.142/205. 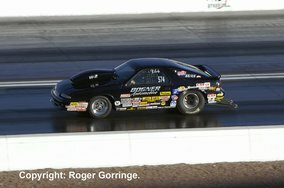 Another 250 mph came from Brad Personett in an all '68 Camaro battle against Joe Baker, the 5.927/250 beat the 6.022/239. The final turned into a burndown between Jay Payne who came in a little late leaving Brad Personett sitting in pre-stage before neither wanted to go all the way in. It all ended with Personett pulling a red light as Payne shot off to record the 5.984/240 win. 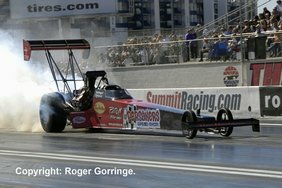 Top Alcohol Dragster had a British entry in the form of Derek Flynn driving the Gold RV/Larry Miersch car but Derek just failed to make the field. Ex-pat Brit Michael Manners went out in round one to Monroe Guest who qualified in top spot with a 5.155/281. The final came down to a battle between Canadian Shawn Cowie and Brandon Johnson, Johnson left first but was hauled in by Cowie who won with a 5.353/267 to the losing 5.455/252. In Top Alcohol Funny Car Jay Payne wrecked his FireIce backed machine during qualifying whilst top qualifier John Lombardo Jr ran a 5.619/253 for that honour. It was Daniel Oliver that got the best of Alexis DeJoria on the money run, 5.658/254 against the losing 5.641/255. Due to inadequate credentials and unsuitable photography points the usual remit of a full class-by-class report and photo gallery was not able to be fulfilled. 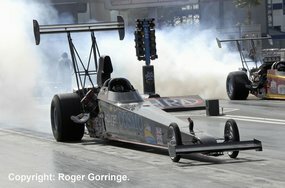 Text and photographs are ©Roger Gorringe, Eurodragster.com and must not be taken, copied or used in any way without written permission. Unauthorised use may result in legal action. 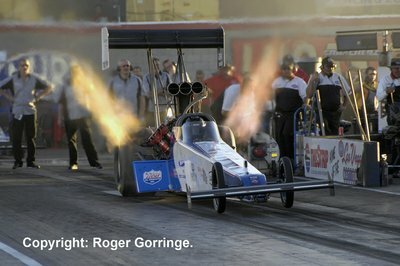 To enquire about purchasing photographs please see the Eurodragster.com FAQ or E-Mail photography@eurodragster.com.